What's in a name? 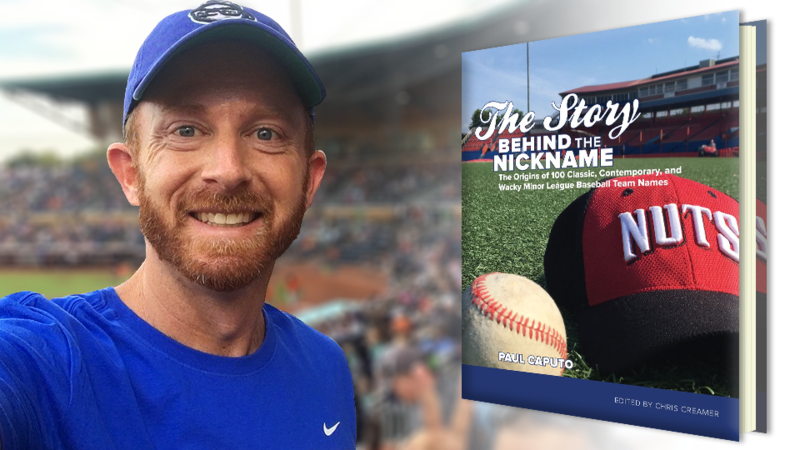 Paul Caputo's new book explores the origin stories behind Minor League Baseball monikers. After spending the past five years writing regular columns about the origins of Minor League team names, Paul Caputo said it "feels like my brain is filled with useless trivia. It's of no use except at parties or in this book." "This book" is The Story Behind the Nickname: The Origins of 100 Classic, Contemporary, and Wacky Minor League Baseball Team Names. It's far from useless, however, as it should appeal not just to baseball fans but to those interested in American culture in general. After all, nearly every Minor League team name -- even those that are explicitly "wacky" -- contains a direct reference to the community in which it operates. Caputo, a Fort Collins, Colorado resident who grew up in the Philadelphia area, traces his interest in Minor League team names to the Lehigh Valley IronPigs. The IronPigs, Triple-A affiliate of the Philadelphia Phillies, played their first season in 2008. "I'm a Phillies fan and noticed the IronPigs," he said. "Someone mentioned that the name was pig iron, inverted. I thought, 'That makes a lot of sense, and there are probably a lot of these stories.' So I tucked that away." As the Phillies' fortunes declined following the 2011 season, Caputo found his sports focus wandering back to Minor League Baseball team names. "I have an educational background as a graphic designer, so logos always piqued my interest," he said. "Then a running theme throughout this book is ice cream helmet sundaes. I've got a collection of over 200. ... When my friends found out about the collection, I started getting helmets in the mail. Then it was like, 'Alright, what's the story with this one? I have to go research it.'" Paul Caputo's ice cream helmet collection helped spark his love of Minor League team names. Caputo founded a blog dedicated to team name origin stories, which captured the attention of Chris Creamer of SportsLogos.net. "Paul was clearly someone who shared my fasciation with the topic," writes Creamer in the book's foreward. "I decided ... that I had to have Paul write for my site ... and share similar stores with our readers." The Story Behind the Nickname, edited by Creamer, is a compendium of articles that Caputo has written over the last five years. "The El Paso Chihuahuas sort of triggered me, to call someone and see what this means," said Caputo. "Are we picking names out of a hat? ... But I found out that they play near the Chihuahua desert, and that El Paso residents have a feisty small-town mentality. And then there's the Akron RubberDucks. Akron has all these tire factories and rubber is an important component of what made the city the city. Finding out that every one of these teams' rebranding was actively seeking out something significant to the community, that was really interesting to me. "I learned so much about small-town America through researching these teams," he continued. "Everything from the Stockton Ports and the town's Asparagus Festival to the Altoona Curve, which has the tightest hairpin railroad curve in America. And I'll never forget where Francis Scott Key is buried because of the Frederick Keys." Caputo divided the book into five parts, providing a rough chronological run-through of Minor League Baseball history. It begins with stalwarts such as the Toledo Mud Mens and Durham Bulls in the "Classics" section, then moves onto "Renaissance: The Minors Reborn," "Rise of the Minors," "The Wacky Era" (of which the aforementioned Chihuahuas and RubberDucks are a part) and, finally, "Dearly Departed." "The idea was to base it on where I saw dividers and industry trends," said Caputo. "In the 1990s teams like the [Lansing] Lugnuts and [Carolina] Mudcats started realizing that they could have their own brand. The 2000s saw more and more teams get away from being named after the parent club, but not as wacky as we see today." For every one of his team write-ups, Caputo spoke to individuals who were integral in the creation of the name. This includes team executives as well as logo designers, most prominently Jason Klein and Casey White of Brandiose. "One fun thing was that later in the series I started calling teams where I didn't expect a great story, and there was almost always a great story," said Caputo. "Like the Batavia Muckdogs -- I had no idea what muck was, but it was a reference to a kind of soil, an agricultural reference. "The Carolina Mudcats are one of my favorites, where there was a guy who bought the team over a bottle of Jack Daniels," he continued. "But my very favorite is the Bakersfield Blaze. [Then-assistant general manager] Philip Guiry had a thousand stories, just so many great stories.... I knew if I kept quiet, Philip would just launch into something else." On SportsLogos.net, Caputo is currently focusing on shorter articles covering alternate team identities such as the Buffalo Wings and Reading Whoopies. But he said he hopes to release an expanded edition of The Story Behind the Nickname on Kindle, featuring an additional 20-25 articles that aren't currently in the book. "I'll keep an eye on new brands," he said. "Now, even Chihuahuas seems kind of quaint."